As is often my custom, I took my bicycle to church Sunday to ride home after the early service, in which choir I sing, while my wife the Music Director stays on to play the late service. These are usually nice rides home without much in the way of time pressure and I can wander a bit. I'd seen that today the construction guys working on the I-35W bridge over the Mississippi were going to lift into place a couple of big concrete segments using some enormous crane on a barge. This sounds fun! 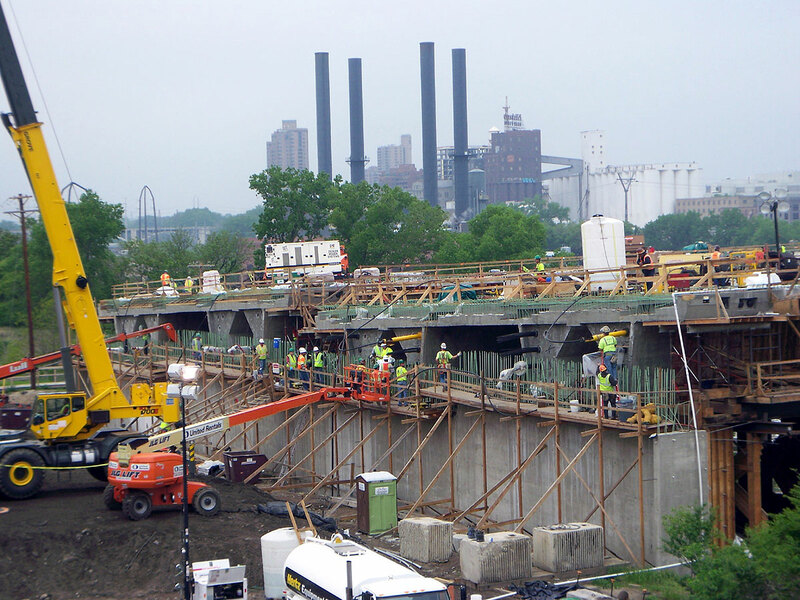 So I rode past the West Bank of the University of Minnesota and onto the 10th Avenue Bridge immediately adjacent to the I-35W bridge construction site. This makes a marvelous viewpoint, by the way, and is fabulously accessible by bicycle. Here's what I saw. Jeez, fellas, I hate to be critical or anything, but it looks to me like these aren't level. This is the land side of the approach to the southern bank of the bridge. This would be by the Holiday Inn, for the locals. 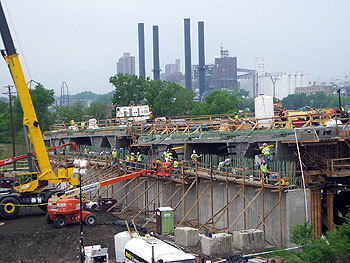 There were a bunch of workers here where the big concrete bridge deck segments were to be placed. I kind of wonder what individual workers do in a lift like this. A bunch were taking photographs. In the background you can see part of the Stone Arch Bridge, now used only for pedestrians and cyclists to get across the Mississippi. On the lower right you can see the downstream lock doors for the Upper Saint Anthony Lock. This is one major crane. 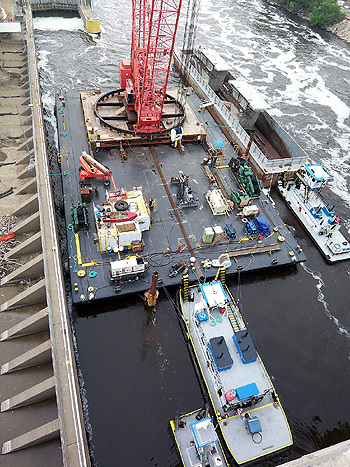 It's two barges side by side and moored to the river bank against a pretty strong current. That's a towboat parked behind the two barges. Off to the right is another barge with the two bridge segments to be lifted with a towboat that had moved them into position. These things are cast in the Bohemian Flats area about half a mile downstream. This used to be a neighborhood full of (you guessed it) Bohemians but it was prone to flooding and they were moved out in the 1960s. It's normally open parkland now, but has proven darn handy in the event a major bridge falls down a few hundred yards upstream. They moved a lot of the steel beams there to figure out what had happened, and now are casting these concrete segments there. The little tiny tow nestled in at the bottom of the photo seems to be a water taxi...at one point, it chugged across the river with somebody, then came back. I suppose getting from one side to the other would be a real pain otherwise. 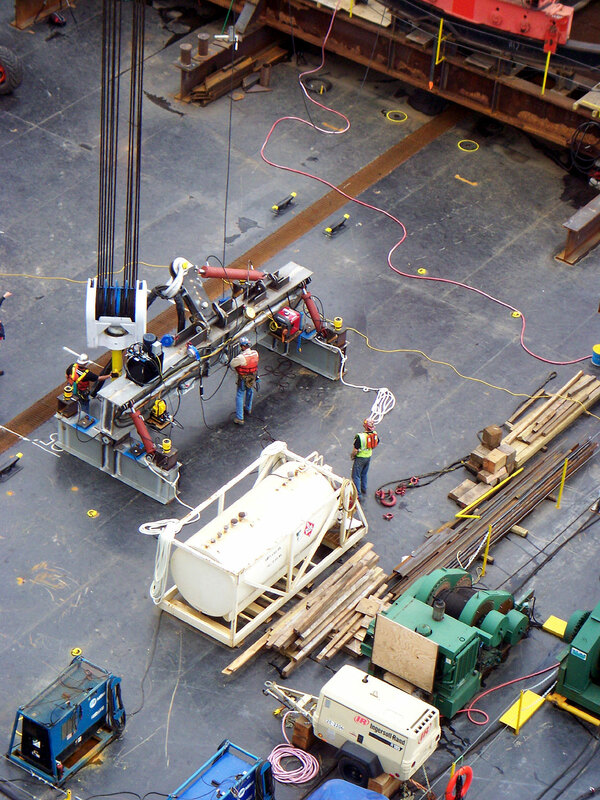 The overall lift scene. 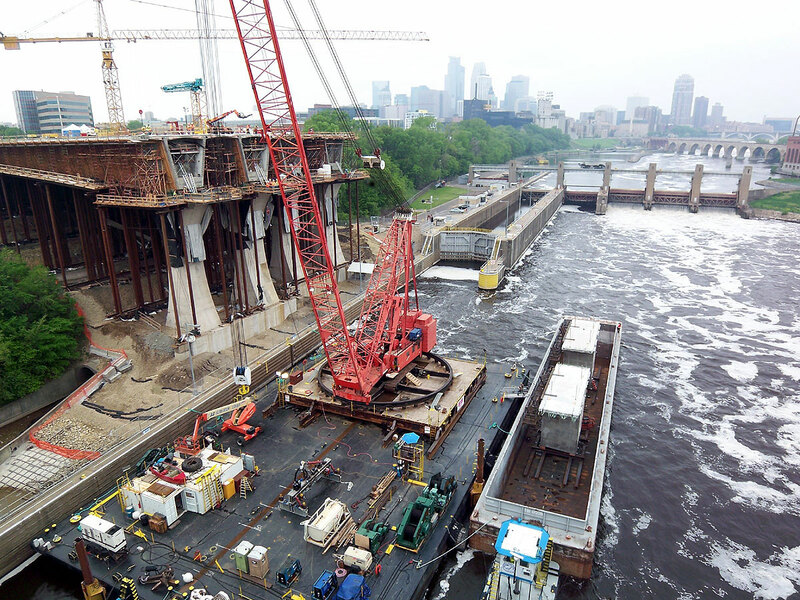 You can see downtown Minneapolis in the background and the Upper Saint Anthony Lock and Dam in the middle distance. The river has some real current to it at the moment. The crane was going to lift this thing, which the workers are fiddling with. Each bridge section had four long rods sticking out of it; near as I could tell, those would go through the four yellow holes in this puppy and be secured somehow, then lifted into position. The pulley on this crane has lots of mechanical advantage and they have to pull oodles of cable to get it move anywhere. Unfortunately, there was lots of standing around activity going on and I had tickets to The Triangle Factory Fire Project ("a whimsical lighthearted romp!") at the Hillcrest Center Theatre at 2:00, so at 12:30, just as some actual activity was stirring on the deck, so I took my reluctant departure and rode on home and didn't see the actual lift. The play was excellent, by the way, but today's performance was the final one. 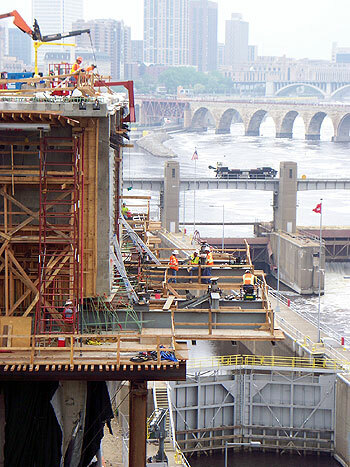 This was opening day for bridge segment lifting, and there are 120 sections to be done, so you still have plenty of time to see more. I'm teaching a class on Commuting by Bicycle on Thursday. This is being done on behalf of the Midway TMO (actually, it merged with the Saint Paul TMO and became Smart Trips). It was to be publicized in a mailing but the mailing hasn't gone out yet. I guess they've been flogging it at some events, but there's no signup required so there's no idea how many people will show. Fifteen, they guess, I'm printing 25 copies of my handout, and this is one of those events that could end up with 3 people or 175. 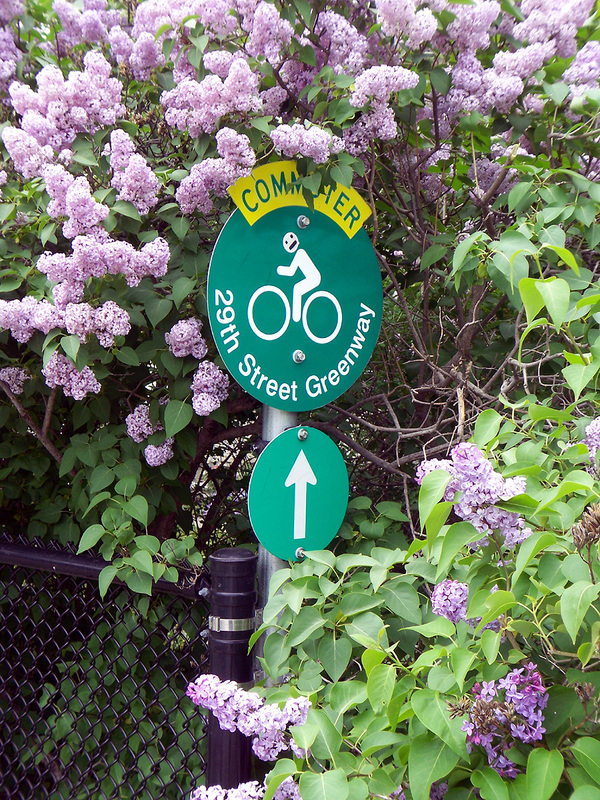 In the event you feel the need for advice from a dilettante commuter such as myself, it will be Thursday May 22 from 6:00PM to 8:00PM at Dayton Avenue Presbyterian Church at 217 Mackubin Street in Saint Paul. Maybe only two civilians will show up and we can impress them with the beauty and efficiency of bicycle commuting by having a bitter and recrimination-filled argument about clipless pedals. I did commute today, what a hero, Me commuting isn't that notable except today I went to Home Depot after work. We're in the midst of a slowly-evolving kitchen renovation and this was the day to talk Cabinets. This isn't all that fascinating, either, but I rode the new bike trail that parallels Saint Anthony Boulevard. This was a disused train line, and in fact where the trail starts off Walnut just south of County C, there is a sign saying that this right of way is reserved for commuter rail use. The implication; the bike path is temporary, and don't whine you cyclists when we take it back. For the moment, and at the rate those projects move, for many years to come, it makes an excellent alternative to ridng on Saint Anthony Boulevard itself, which is four-lane divided and likely to be regarded as almost Interstate-like by motorists. To get to the trail, I rode down Cleveland and took County C west. County C west of Cleveland pretty much blows. East of Cleveland there's a superb bike path south of the road AND a four- or five-foot shoulder for those who disdain sidepaths. West of Cleveland there's hardly any shoulder beyond the two travel lanes each way and it's concrete with lots of cracks and potholes indifferently filled in with asphalt. At least there's plenty of truck traffic and impatient motorists. Since it's outside of Saint Paul, it's not under the purview of the Saint Paul Bicycle Advisory Board and I don't know of any plans for the lousy bit of County C, but if they rebuild it to the standards of the road east of Cleveland it would be an excellent route towards downtown. Although this isn't exactly unexplored territory for me (although I hadn't been on the trail, which opened last fall), I did consult my excellent Twin Cities Bike Map, 9th edition (that's the brand new edition, just out). Little Transport Press has become Bike Everywhere which I think is just a new name. I really like this map and am constantly surprised by the number of cyclists who don't have it. I'll be urging it on those who attend my Commuting Class because I have found it very trustworthy over the years. The price went up to $11.95 from $9.95 but it's printed on some kind of waxy paper that is supposedly water resistant, which is good because my older ones have gotten pretty worn being carried around. You should get one of these maps. 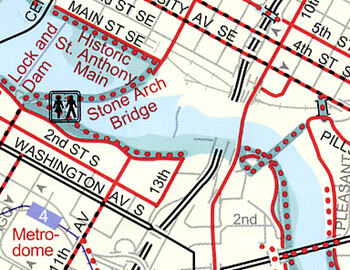 The I-35W bridge over the Mississippi is missing on the map. He'll have to put it back in, of course, but it won't affect cyclists other than to reopen the bike path on the east bank. Speaking of bridges, I got an email noting that in the flurry of self-congratulatory bill passing at the last minute by our government (our Governor Tim Pawlenty seemed more agreeable than usual, perhaps hoping that next year he'll be Vice President) was a couple of million bucks to remove and rebuild the Cedar Avenue Bridge over the Minnesota River in Bloomington. This will be for cyclists and pedestrians only and is a useful connector across the river. Doug will have to update the map again; right now, his says "Bridge Out" at that spot. He also still shows the Lowry Avenue bridge open; it had a pier move 11 inches and our suddenly bridge-sensitive government closed it down (the same happened to a bridge in Saint Cloud, and the Hastings Highway 61 bridge is down to 1 lane due to buckling gusset plates...sheesh, you have one Interstate Bridge drop off the map and all of a sudden people give a damn about our crumbling infrastructure). It's getting hard for a cartographer to keep up with the bridge status in this state. 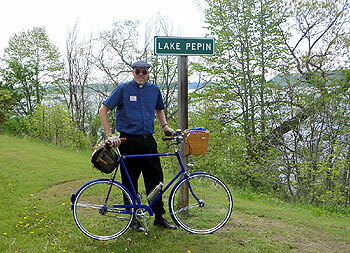 The 2008 episode of the Lake Pepin Three Speed Tour was this past weekend. As always, Jon and Noel organized a wonderful event. We gathered in Red Wing, rode to Wabasha Saturday with some tailwinds and a spot of rain to make in an official Three Speed Tour, had the usual bash at the Eagle's Nest Coffee Shop Saturday night, then gathered to ride back Sunday. It was cooler Sunday, sunny, but we had stiff headwinds. Fortunately, these were often screened along the river but the group that took the highlands route out of Wabasha suffered for their decision though I gather there were terrific views. There was a Brew Up in Lake City, the usual social gathering in Old Frontenac, the excitement of the Hill Avenue climb and descent for many of us, then the slog into Red Wing into the teeth of the wind and the post-ride gathering at the Staghead. This was of course all done on three-speed bicycles whilst dressed in proper ladies-and-gentlemen fashion. 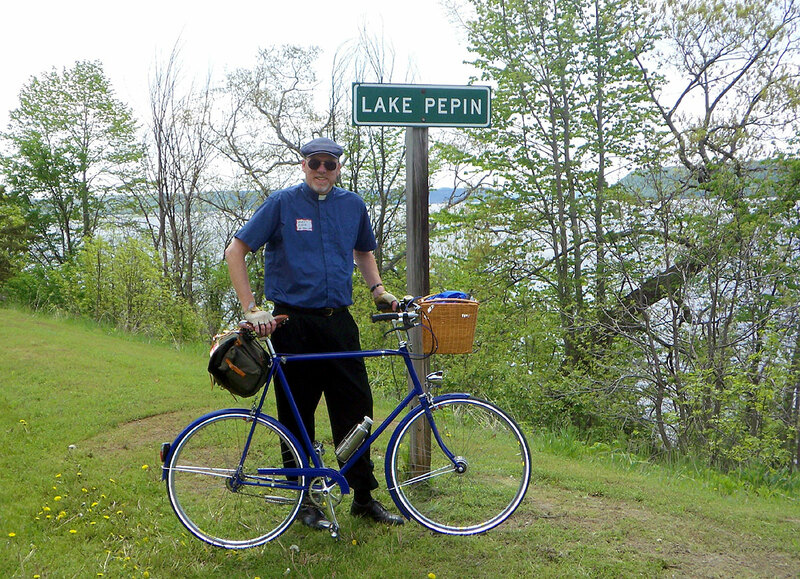 In my case, I again went as the Quicker Vicar, seen here at the Lake Pepin sign on the Wisconsin side. Last year I took the easy way out, sticking to Highway 35 south of Maiden Rock rather than taking the County AA/E climb to the top of the bluffs. This year, I climbed. Actually, I walked a bit of it, but it turns out that not much easier on the legs than riding. Once atop Maiden Rock, which had been ridden to by a tandem pulling a trailer and many riders including several young ladies in skirts and heels, we fell about to bask in the view and the sunlight. 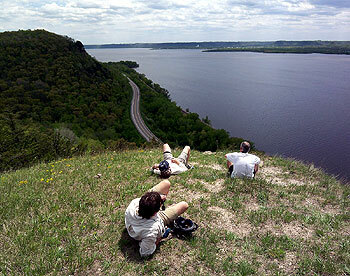 That's Wisconsin Highway 35, the lowlands route, down below. The ride across the dandelion meadow is just about the only off-road riding I do all year. The reward is great, since two years ago I'd done the Death March selection for the loop and bypassed this outcrop by accident. It's worth going out to. I'll write more, but it'll be a few days. Got a busy week coming up. To all who rode the Tour, thanks for a great event, it's terrific how our little bit of alternate reality for two days creates such a high and it's a priviledge to ride with you. It makes a great kickoff to the summer cycling season. It's Bike to Work Day in Saint Paul. Convoys formed at various points around the city and rode downtown to food and prizes and speeches. I don't work downtown, though, and am hoarding vacation time for other purposes, so just rode to work by myself. I stopped at the dry cleaners to drop off some trousers to get cleaned and pressed for my clerical duties at this weekend's Three Speed Tour. I rode down Hoyt and took Hamline north up to Larpenteur, where I got in the left turn lane. A motorcycle pulled up next to me in the straight-through lane. Crossing traffic stopped, southbound Hamline traffic got the advanced-left signal and began going, I got poised to start, and....cross traffic started up again. Neither I nor the motorcycle were heavy enough to trigger the traffic light. Now, there was a segment on Channel 5 IMissedIt News a week or two ago about cyclists' running red lights and stop signs. Now here we were, me and the motorcyclist, obeying the traffic semaphores as cars stacked up behind us. If we strictly followed the law, nobody would go anywhere, ever. I checked to make sure no cars were filtering forward to right-on-red, and rode over to the pedestrian crosswalk button and pushed it, then rode back into my left turn lane. Half a minute went by and cross traffic stopped. This time the southbound traffic got the advanced left again, but our lights turned green and we got to go. I hope that the motorists stacked up behind us noted that traffic signals don't always work for cyclists and that sometimes we have to take a liberal interpretation of their meaning or nobody goes anywhere. I saw a couple of other riders along the way. I rode up Hamline rather than my usual Lexington to work, so am not sure if these folks are regulars or not, but a couple looked well-equipped (panniers, attire) and waved as they went by. No speeches at work, no free food, no prizes, just another day riding past the gas stations with their $3.72 signs up. With those kinds of prices, and possibly worse to come (a story last night on the news noted that many older gas pumps don't go past $3.99 a gallon, a faint echo of the late 1970s or was it early 1980s when older pumps wouldn't go past 0.999 a gallon), there may be more of us on the road. Give them a wave when you see them. That's an interesting point about the poor past in the last bit I cite above. I have read that in bicycle-friendly Amsterdam, one of the challenges is getting immigrant communities, especially Muslim ones, to adopt bicycling. It's not part of the cultural background for many in these communities, and, in an echo of late 19th-century America, the freedom bicycles allow women is discomforting to the traditional social structure. Giant also manufactures battery powered bikes which are popular in China where the company operates three factories. Battery-powered bikes are a big hit as China's economic boom puts money in the pockets of even the poorest factory workers who almost immediately upgrade their bikes. Now, 25-km an hour is only about 16 mph, but that's still a useful speed, faster than my usual cruising in-town, and gets rid of some of the sweatiness that inhibits many people from commuting. Maybe this will become a market in this country as well.